Southeast Asia’s leading economies have some of the wider region’s fastest growth rates and most pressing infrastructure needs — as well as the biggest divides between reconciling the two. To say that Philippine President Rodrigo Duterte’s chairman’s statement issued on April 29 following the 30th ASEAN Summit in Manila was a little soft on China “would be an understatement,” a Philippine diplomat told me hours after its release. Asian Development Bank President Takehiko Nakao sees three key ways in which the institution has paved the way for the region’s economic emergence. The Walt Disney Company South East Asia on Wednesday said it has appointed Veronica Espinosa-Cabalinan as Philippine manager. DIGITAL economy will be a key priority for Asean next year as Singapore takes over chairmanship of the regional bloc, the city-state’s Minister for Trade and Industry (Trade), Lim Hng Kiang, said on Thursday. GROWTH in China and Japan will anchor growth in the Asean+3 region, which is expected to slow slightly to around 5.2 per cent in 2017 and further deepen to 5.1 per cent in 2018, according to the inaugural flagship report of the Asean+3 Macroeconomic Research Office (Amro) released on Thursday. Support from Asean for robust implementation of sanctions against North Korea is likely to figure prominently when visiting Asean foreign ministers meet US Secretary of State Rex Tillerson today (US time). ASEAN is a success in many ways. Since the regional bloc was founded 50 years ago, the number of member nations has doubled. The region has also long been peaceful and prosperous, thanks to the absence of inter-regional conflicts and impressive economic growth. Five young people from Laos attended a workshop on media literacy along with other Asean countries at the 2nd Asean Youth Workshop held in Bangkok, Thailand, from April 24-28. Asean (the Association of South-east Asian nations) has let itself down again for buckling under external pressure and whitewashing the chairman’s statement of the 30th Asean Summit, which concluded in Manila over the weekend. Not for the first time, territorial disputes in the South China Sea were the spoiler. China is willing to work with members of the Association of Southeast Asian Nations (ASEAN) to fully implement the Declaration on the Conduct of Parties in the South China Sea (DOC), a Chinese Foreign Ministry spokesman has said. Since his ascent to the presidency, Mr Rodrigo Duterte has overseen a remarkable reorientation in Philippine foreign policy. Promising an independent course that would “not be dependent on the United States”, the tough-talking Filipino leader has downgraded military cooperation with Washington and taken a radically divergent approach to Beijing. The United States is bringing its Southeast Asian allies on board to tackle what senior officials described as the number one national security priority for the U.S. — North Korea’s nuclear proliferation and missile threats — when foreign ministers from Association of Southeast Asian Nations (ASEAN) gather Thursday in Washington. Indonesian exports of completely built up (CBU) car units surged in the first quarter of 2017, a development that may indicate that global economic growth is improving (specifically in the export destination nations). Based on data from the Indonesian Automotive Industry Association (Gaikindo) Indonesia exported 56,371 units in Q1-2017, up 53.4 percent year-on-year (y/y) from 36,750 units in the same period one year earlier. UK-based Andalas Energy and Power has commenced the next steps in advancing its plans to develop a portfolio of wellhead independent power projects (IPPs) targeting 250-500MW of installed capacity fired with gas from proven fields. The Ministry of Finance revealed on Wednesday (03/05) that it foiled an attempt last week by a local textile company to claim a tax refund by falsely reporting the value of its exports, raising concern that such cases may be rife. That Indonesians aren’t big readers is not surprising – last year, a study ranked Indonesia 60th out of 61 countries in terms of interest in reading. A big reason for this is undoubtedly the lack of access to books in many of Indonesia’s remote regions. Entering the second half of his leadership tenure, President Joko “Jokowi” Widodo has approved various development projects that will become final additions to the current administration’s list of national strategic projects. Tidal Bridge BV, a joint venture of Strukton International and DEC, has been awarded the contract to construct the Palmerah Tidal Bridge in Indonesia. The Dutch company will build a floating bridge in the Larantuka Strait, located in East Flores in the eastern part of Indonesia. The Jakarta city administration is currently drafting a gubernatorial regulation exempting home owners of houses worth less than Rp 2 billion (US$150,000) from the Urban and Rural Land and Building Tax (PBB-P2). Indonesia will be among the largest recipients of loans from the Asian Development Bank to finance projects aimed at mitigating water shortages over the next three decades. Vice President Jusuf Kalla said the media is a pillar of democracy in Indonesia, during his opening speech at a World Press Freedom Day celebration in Jakarta on Wednesday (03/05). Dairy and food producer PT So Good Food Indonesia has exported packaged milk to Myanmar for the first time, setting up a spring board to expand sales to ASEAN in the future. As of March this year, the number of Twitter accounts reached 328 million globally, representing a 14 percent increase from the same period last year. Indonesian ship builder PAL will continue to export military vessels to the Philippines, with a Tarlac class strategic sealift vessel, or SSV, expected to be delivered in the coming weeks. Australia has called on Indonesia to reinstate a moratorium on the death penalty at the United Nations, just days after the second anniversary of the executions of Myuran Sukumaran and Andrew Chan. Indonesia and China agreed in a meeting on Wednesday to intensify intelligence sharing in their quest to eradicate drug trafficking. Indonesia is assessing projects to remove its capital from Jakarta due to a number of infrastructure problems and to expand economic and cultural development to other regions of the country. Malaysia’s Axiata Group has signed a four-year agreement to lease capacity over Thaicom’s IPSTAR-1 satellite for the provision of broadband services in Indonesia. Indonesian Government has prepared a Rp1 trillion budget for the annual World Bank-International Monetary Fund (WB-IMF) that will be held in Nusa Dua, Bali next year. A human rights advocate says more needs to be done to stop threats and violence against journalists in Indonesia’s West Papua region. Following an audit conducted by the State Audit Organization, an estimated 3.135 trillion kip (USD 384.776 million) has been uncovered as additional revenue, representing 3.11% of the total state revenue. Cambodia, Laos, Myanmar and Vietnam plus Thailand (CLMV+T) have reaffirmed their commitment to strengthen their cooperation in promoting tourism. Laos typically welcomes help from China. About 23% of the landlocked Southeast Asian country’s 6.8 million people live in poverty. In a bid to lower maternal and child morbidity and mortality, Laos will aim to reduce the unmet need for contraception to 13 percent and increase the contraceptive prevalence rate using at least one method from 42 to 65 percent by 2020. The Regional Workshop on Methods and Strategies for Implementing Public Private Partnerships in the Tourism Sector for Cambodia-Laos-Myanmar-Vietnam plus Thailand (CLMV+T) is being hosted in Vientiane on May 3-4. The Republic of Korea (ROK) has signed an agreement with the Lao government for a soft loan of over 400 billion kip (approx. USD 53 million) from the ROK for the development of Mekong Riverside in Pakse, Champassak, the southernmost province of Laos. The Lao Youth Union wants the Law on Youth Union to uphold the role and responsibility of the mass organisation by strengthening its organisational features. Prime Minister ThonglounSisoulith has said that a helping hand should no longer be given to anyone working in public administration, but suggested that such support instead go to volunteers working for the government in remote and rural areas. Lawmakers at their ongoing 3rd Ordinary Session on Wednesday approved amendments to the Law on the Lao People’s Revolutionary Youth Union’s (LPRYU) Executive Committee. The National Commission for Women and Children (NCWC), in collaboration with the Ministry of Health held the 1st National Family Planning Conference in Vientiane Capital on May 3. When he arrived in Sydney as a student in 2001, Ariya Khamvongsa spent his first days sightseeing. I recently took an incredible journey to Chiang Khong, a city in Chiang Rai Province in the far north of Thailand, where I had the opportunity to enjoy diverse aspects of Lao, Thai and Burmese culture. Bank Negara Malaysia (BNM) announced that Islamic banks are no longer required to maintain a reserve fund effective May 3. A US$1.7 billion property deal that was expected to ease the debt burden of Malaysian state fund 1Malaysia Development Berhad (1MDB) fell through on Wednesday (May 3), complicating Prime Minister Najib Razak’s efforts to move on from a financial scandal surrounding the fund. Younger investors are entering the market in larger numbers, with Bursa Malaysia revealing a 36% jump in the number of Central Depository System (CDS) account holders aged 25 years and below. Bandar Malaysia, a massive undertaking here with an estimated gross development value of RM150 billion, will have a new master developer. Malaysia and Kazakhstan plan to further strengthen bilateral economic ties after both countries saw an over 30 per cent increase in two-way trade last year. A deal by a former unit of troubled state fund 1Malaysia Development Berhad (1MDB) to sell its stake in a property development project to a consortium including China’s state-owned China Railway Engineering Corporation (CREC) has lapsed. The Melaka state government on Wednesday (May 3) announced that the name “Malacca” for the state, commonly used in English, will cease to be used and instead be replaced with the name Melaka. A bold move by City Hall to introduce new guidelines for foreign owned businesses in the city is expected to draw more high-end foreign businesses to operate in the city centre. A general manager of a Prasarana firm in charge of overseeing technical support for a bus complex here has been detained for allegedly taking half a million ringgit for personal gain. The prime movers of the development of Bandar Malaysia, the consortium called ICSB comprising Iskandar Waterfront Holdings Sdn Bhd (IWH) and China Railway Engineering Corp (M) Sdn Bhd (CREC), have found themselves out of the deal to develop the choicest piece of land in the city. Hong Leong Investment Bank Research believes Tenaga Nasional Bhd (TNB) becoming the controlling shareholder of project Track 4A will serve as the best available choice in order to ensure power security over the longer term. The ringgit retreated from yesterday’s gains to open marginally lower against the US dollar today on mild profit taking, dealers said. I-Bhd is confident of generating RM500 million in revenue this year, up from RM383.6 million in 2016. Malaysia and Singapore have topped the list of Organisation of Islamic Cooperation (OIC) and non-OIC markets respectively for the third consecutive year, according to the Mastercard-CrescentRating Global Muslim Travel Index (GMTI) 2017. The three intertwined principles of Wala’ (loyalty), Wasatiyyah (moderation) and Tabayyun (understanding) if practised properly, will embody a perfect cycle between the leaders and those being led for the survival of a nation that craves progress and ultimate success according to Islamic interpretation, said Prime Minister Datuk Seri Najib Tun Razak. In the last five years, the typical Malaysian online shopper has “transformed” from a young urban male to a family man. Or woman. Myanmar appears poised to escape international scrutiny of its vast and expanding human rights abuses targeting its Rohingya minority. The April 28 forced closure of two madrassas in downtown Yangon by a mob of ultra-nationalist protestors backed by Buddhist monks was the latest indication that anti-Muslim vehemence is still a virulent undercurrent of instability in Myanmar’s unconsolidated democratic transition. US government agency Overseas Private Investment Corporation (OPIC) is making a debt capital investment of $5 million in Early Dawn Microfinance Company Ltd (DAWN), a Yangon based deposit-taking micro-lender. CIMB Equities Research is maintaining its Reduce call on Daibochi Plastic &Packaging pending further financial details on the Myanmar joint venture at the company’s 1Q17 results briefing this Friday. Myanmar press freedom has hit an all time high, ranking No. 3 in ASEAN just behind Indonesia and the Philippines, according to the latest survey by Paris-based Reporters Sans Frontieres (RSF). The third of May is World Press Freedom Day, as declared by the United Nations General Assembly in 1993 and supported by the UNESCO General Assembly. An event has been held in Myanmar every year since 2012, and yesterday it was held at the Chatrium Hotel. Media access to officials and information in Myanmar has become more difficult under the year-old civilian government of de facto national leader Aung San Suu Kyi, despite indications the situation would get better, the chairman of a press organization said Tuesday. State Counsellor Daw Aung San Suu Kyi on Tuesday rejected a decision by the UN’s rights council to investigate allegations of crimes by Myanmar’s security forces against the Rohingya community in Rakhine State. The Myanmar Investment Commission (MIC) says it has granted nine citizens’ investments, including the Nampaw Hydropower Project and 12 foreign schemes. The current interest rate cause buyers to pay double the cost of an apartment despite use of an installment plan, said Khin Maung Than, chairman of Myanmar Real Estate Association. Where possible, contracts that have robbed the state of much-needed revenue should be renegotiated to reflect market rates. Police are hunting five gem scavengers who discovered a huge jade boulder at a mine in northern Myanmar after a senior regulatory official accused them of leading an attempt to steal it. Up to $770 million worth of Philippine water- and sanitation-related projects for implementation in 2017-2019 are up for Asian Development Bank (ADB) approval, according to a table the regional lender distributed to visiting journalists here by e-mail. THE PHILIPPINES has exported 1.7 billion euros worth of goods to the European Union (EU) last year under a trade perk that allowed zero tariff for various local products, a nearly 10-per cent increase from 2015 that raised the stakes for the trade benefit, which the country might lose due to the government’s anticrime efforts. The Generalised System of Preferences Plus (GSP +) status, a condition. THE Department of Foreign Affairs (DFA) on Wednesday asked China “to refrain from the threat or use of force,” including firing warning shots, in driving away Filipino fishermen from the West Philippine Sea (South China Sea). Davao-based businessman Dennis Uy has obtained a provincial license from the state-controlled Philippine Amusement and Gaming Corp. (PAGCOR) to develop a $300-million integrated gaming resort in Cebu. The GMR-Megawide consortium which is currently operating the Mactan Cebu international airport in the Philippines, is in race for the Davao airport in the Far Eastern nation. Lawmakers in the Philippines have removed the environmental secretary, who angered the mining industry by ordering the closure of more than half the country’s existing mines. SENATOR Grace Poe on Wednesday filed a resolution calling for a Senate investigation into the reportedly anomalous Metro Rail Transit Line 3 (MRT-3) maintenance contract between the previous Aquino administration and Korean firm Busan Universal Rail Inc. The Communist Party of the Philippines said it lost a friend in its struggle to defend the environment with the Commission on Appointments’ rejection of the appointment of Gina Lopez as Environment secretary. A governor, his aide, and a police officer were charged with murder in the Philippines on May 2, on the eve of International Press Freedom Day, for the killing of a journalist in December. SM Prime Holdings Inc marked its fourth listing of retail bonds with its issuance of up to $300 million (P15 billion) fixed rate bonds due in 2024. While political risks are “worrisome,” the Asian Development Bank (ADB) sees continued strong economic growth for the Philippines. The government and rebels in the country’s south have made “significant progress” in preventing the recruitment of children in armed conflicts although children’s deaths and injuries remain a concern, a United Nations report said. The House of Representatives committee on ways and means approved yesterday a consolidated bill imposing a P6 diesel tax and increasing levies on other oil products and on cars. The Philippine Drug Enforcement Agency (PDEA) now estimates that there are 4.7 million drug personalities in the country, the highest figure cited by the administration since launching the drug war last July. After the ASEAN Summit in the Philippines, the discussion on sustainable and inclusive growth for the region continues, as 5,000 participants from all over the word gather here, for the 50th Asian Development Bank (ADB) Annual Meeting. Authorities seized P300,000 worth of shabu from a drug suspect in a buy-bust operation in this city Wednesday night. BMI RESEARCH, an arm of Fitch Ratings, said the government’s aggressive spending program will help the transport sector grow by an average of 9.5% annually over the medium term, though risks to growth include delays in certain projects funded via public-private partnerships. The House of Representatives approved on third and final reading 45 bills as the chamber’s leadership moved to act on at least 10 more bills of national application that have been included in the list of legislative priorities this month. If the last two decades of anti-establishment rule are any guide, the world may be on the brink of some monster stock rallies as it takes a turn toward populism. The US Federal Reserve’s latest decision to keep key lending rate unchanged was widely anticipated, but policy makers expect to raise rates twice more for a total of three increases for 2017 – more hikes than they had made in the previous 10 years combined. The Nikkei Singapore Purchasing Managers’ Index, or PMI, rose to 52.6 in April from 52.2 in March, hitting the highest reading in five months. April’s growth was supported by expansions in output and new orders. Singapore’s National Research Foundation (NRF) will invest S$150 million ($107.3 million) in building the city-state’s capabilities in artificial intelligence (AI), with an emphasis on finance, healthcare and city management solutions. UP to S$150 million will be committed to AI.SG, a new national programme that seeks to boost Singapore’s capabilities in artificial intelligence (AI). The Smart Nation and Digital Government Office (SNDGO) and Government Technology Agency of Singapore (GovTech) have launched a pilot with four banks to enable people to use their registered profile on Singapore government’s MyInfo service to apply for new bank accounts. At Decision Sciences International Corp.’s Poway headquarters, a 20-foot shipping container sits beneath a car-wash size scanner. Authorities intercepted a “sizeable quantity” of “ice”, cannabis and Erimin-5 that arrived at Woodlands Checkpoint in the guise of washing powder, flour and cereal, the Immigration and Checkpoint Authority (ICA) said on Wednesday (May 3). To respond quicker to marine emergencies, the Singapore Civil Defence Force (SCDF) yesterday introduced two new Rapid Response Fire Vessels (RFVs). Singapore shares extended gains into a second session on Wednesday, helped by financials, while most other Southeast Asian markets finished lower as investors were cautious ahead of the U.S. Federal Reserve’s policy decision. MYINFO, Singapore’s digital personal data platform, which allows users to auto-fill details like their name, identity card number and registered residential address on government online forms, can now be used with four banks to auto-fill forms. RIDING on a wave of improved sentiment around the world and in China, Pan-United Corporation said on Wednesday that it will spin off its profitable China river ports business and list it in Hong Kong as Xinghua Port Holdings. SINGAPORE stocks opened flat on Thursday, with the Straits Times Index gaining 0.25 points to 3,238.06 as at 9.02am. Interns working at foreign investment banks in Singapore and sovereign wealth fund GIC can receive between $3,000 and $5,000 monthly, according to data compiled by jobs site Glassdoor. Scientists have found more evidence that a diet high in saturated fats is linked to more inflammation in the gut that, in turn, could cause colorectal cancer. Thailand’s exports are expected to grow 5 percent in April-June from the same period a year earlier, a similar pace to the first quarter, as buyers continue to build up inventory, a group of Thai shippers said on Wednesday. 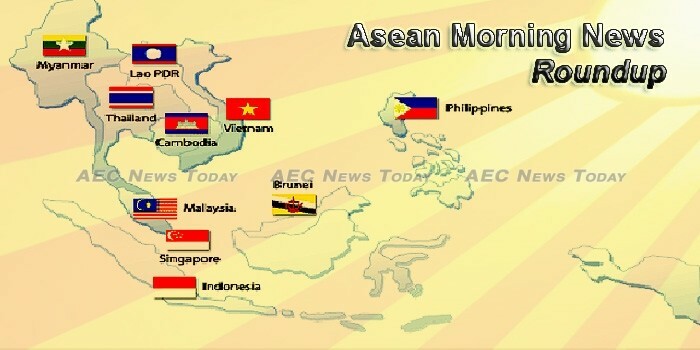 With the Eastern Economic Corridor (EEC), Thailand hopes to develop its eastern provinces into a leading ASEAN economic zone. The EEC straddles three eastern provinces of Thailand – Chonburi, Rayong, and Chachoengsao – off the coast of the Gulf of Thailand and spans a total of 13,285 square kilometers. The government is considering a new policy to lend support to “micro-SMEs” — businesses that are smaller than small and medium-sized enterprises (SMEs) — to help strengthen the Thai economy, says Industry Minister Uttama Savanayana. The property market’s slowdown has prompted some makers of construction materials and furniture to rely more heavily on overseas buyers and rush new products to market in a bid to boost sales in the second half of the year. Related agencies in the eastern province of Chon Buri are planning to demand the Marine Department to address pollution problems that have damaged the ecosystem and tourism of Koh Sichang. The government expects its two technology megaprojects — the development of a digital innovation park and smart cities — to attract foreign Chinese direct investment this year. The government is moving ahead with education reform to reduce inequality in preparation for the development of community economy. The Finance Ministry may need to hold more than a 49% stake in state-owned Islamic Bank of Thailand (IBank) if the bank fails to draw new partners, according to the bank’s recapitalisation plan scheduled to go before the cabinet for approval in the next two weeks. A Thai human rights lawyer could be sentenced to a maximum 150 years in prison after he was charged with a record ten counts of royal defamation, a rights group said Wednesday. As part of security step-up in the restive Deep South, people in the three southern provinces of Yala, Pattani and Narathiwat and four districts of Songkhla will be required to stamp their fingerprints when buying SIM cards for their mobile phones. Thirty media bodies in Thailand marked World Press Freedom day on Wednesday by calling on the military government to scrap legislation that seeks to tighten control of news reporting in the Southeast Asian country. The Transport Ministry has rejected the Thai-Chinese high-speed train project between Bangkok and Nakhon Ratchasima due to incomplete feasibility study. Government pawnshops across the country have prepared millions of baht in cash as parents need money to buy their children school supplies before the new school year. Commerce Minister Aphiradi Tantraporn unveiled guidelines for driving regional businessmen into neighboring countries’ markets, through the utilization of the Asean Design & Business Center. The Thailand government plans to build a new cloud data center in Bangkok as part of an ongoing initative to modernize its facilities and use them more efficiently, according to a report in the Bangkok Post. The Board of Investment (BOI) Secretary General disclosed that SUBCON Thailand 2017 aims to pair up to 6,000 business partnerships and expects to generate a cash flow of 10 billion baht. Tourism and Sports Minister Kobkarn Wattanavrangkul met her Cambodian counterpart Thong Khon in Bangkok last Friday in the first Cambodian-Thai Tourism Ministerial Meeting. Apple, Facebook and Google logos have been removed from a giant statue of a mythical beast that will stand inside the sprawling cremation complex being built for Thailand’s late king after their inclusion caused an online outcry. OriginClear Inc. (OTC/QB: OCLN), a leading provider of water treatment solutions, announced today that it agreed in principle to address the country’s long-term water crisis by directly targeting 2.8 million small and medium enterprises (SMEs). Police are hunting for an illegal Chinese tour guide who abandoned 24 Chinese tourists at the side of the road in Phang Nga yesterday evening after arguing with them about money. Members of the public are warned not to buy or sell their bank accounts or ATM cards or they may face jail terms and/or fines on money laundering charge. The Secretary General of the Anti-Money Laundering Office (AMLO) has warned the public against online frauds, offering to buy and sell book banks and ATM cards through Facebook while promising high returns. The textile and garment sector enters the second quarter (Q2) of this year with promising signs from new import markets, said General Director of the Việt Nam Textile and Garment Group (Vinatex) Lê Tiến Trường. THE NUMBER of international visitors to Vietnam in the first four months of this year was estimated at 4.28 million, representing a year-on-year surge of 30.3 per cent. April had the highest number of newly-established enterprises in the past 12 months, according to the Ministry of Planning and Investment’s National Enterprise Information and Registration System. Deputy transport minister hopes for ‘positive competition’ between two lenders. Asia has two multinational lenders on the scene — the Asian Development Bank and the Asian Infrastructure Investment Bank, a situation some view as a recipe for rivalry. Others, however, see it as an opportunity. Water operations supported by the Asian Development Bank (ADB) have played an important role in strengthening water security in Vietnam’s most water-stressed areas. Despite falling shipments and a smaller crop, Vietnamese rice prices remained stable over the past month and were cheaper than Thai rice. Shares advanced during the first session on Wednesday after the National Reunification and International Labour holidays as investors remained positive about the market outlook. Sài Gòn Beer, Alcohol and Beverage Corporation (Sabeco) announced its net profit in the first quarter of 2017 rose 18.8 per cent year-on-year to VNĐ1.12 trillion (US$49.78 million). Pacific leaders are being urged to increase the pressure on Vietnam to accept responsibility for its fishermen poaching beche de mer and other marine resources in coastal waters. An elevated highway connected to Tan Son Nhat International Airport in Ho Chi Minh City is expected to begin construction at the end of the year, with capital investment estimated at VND2.6 trillion (US$114.3 million). Having a karaoke-addicted neighbor is a nightmare, but the proliferation of ‘mobile karaoke,’ whereby anyone with a bluetooth microphone and a smartphone app can be a singer at anytime, anywhere, only serves to worsen the situation. As the long weekend holiday came to its end, people rushing back to Hanoi and Ho Chi Minh City brought with them a traffic congestion nightmare at entrances to both cities. Vietnam plans to cut pork imports and expand export markets for the meat as part of an unprecedented nationwide campaign to rescue pig farmers, the government said. A U.S. citizen flying from Ho Chi Minh City, Vietnam, to Los Angeles Airport was arrested by federal agents in March for smuggling 93 exotic birds in his luggage, according to U.S. Customs and Border Protection statement Wednesday. Standards on emission concentration in Việt Nam are below international standards. More pollutants in Việt Nam, therefore, can be emitted than in other countries, said Ngụy Thị Khanh, Green Innovation and Development Centre (GreenID) executive director in Hà Nội in a panel discussion on air quality held by the US Embassy on Wednesday. After nearly 50 Cambodian taxi drivers blocked a border checkpoint in Kandal province on Tuesday to protest their Vietnamese counterparts’ methods of picking up passengers, authorities cut a deal to even out the competition, police said.